The president promised earlier this month at the Conservative Political Action Conference (CPAC) that he would do something about what he called a political climate on liberal college campuses that chills discourse. His executive order conditions research funding on "compliance with the First Amendment" and directs federal agencies to ensure that institutions receiving federal research or education grants "promote free inquiry." 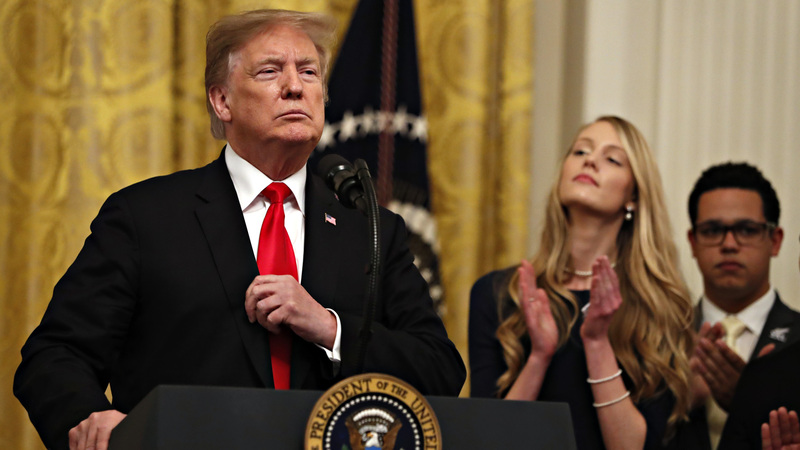 During the signing ceremony at the White House, Trump specifically called out "professors and power structures" that keep young Americans from "challenging rigid far-left ideology," and lamented that many universities have become "increasingly hostile" to free speech. "We will not stand idly by and allow public institutions to violate their students' constitutional rights," Trump said. "If a college or university doesn't allow you to speak, we will not give them money. It's very simple." Reaction to the order was mixed. Some said it's unclear how that directive will play out at colleges, which say they already promote free inquiry. Others noted the executive order was basically just a restatement of existing law and lacked the tough tone heard at the White House ceremony. "The executive order essentially directs federal agencies to ensure colleges are following requirements already in place," reported the education publication Inside Higher Ed. "And it doesn't spell out how enforcement of the order would work." Ted Mitchell, president of the American Council on Education, called the executive order a "solution in search of a problem" and cautioned that it provides no clear steps on implementation. "It is neither needed nor desirable, and could lead to unwanted federal micromanagement of the cutting-edge research that is critical to our nation's continued vitality and global leadership," Mitchell said. But the College Republican National Committee applauded the order. "College campuses are ground zero in the campaign by the liberal left to shut down conservative dissent," chairman Chandler Thornton told Politico. "President Trump's executive order is critically needed because college and university bureaucrats have absolutely failed to protect free speech on campus." The Foundation for Individual Rights in Education — a group that supports free speech on campus — was circumspect. "It really is reinforcing existing principles and law," legislative and policy director Joe Cohn told the Chronicle of Higher Education. "Of course, the devil is going to be in details." Cohn said a new federal bureaucracy devoted to policing campus speech "could be unhelpful." Speaking on NPR's Morning Edition, incoming University of Southern California President Carol Folt said that she's always been concerned about chilling effects on free speech on campus. "And you do hear students say that they feel sometimes that they can't say things," she said. "But it comes from all sides. So the point is, we have to work on that, to keep it open, and make it possible for students to talk in a way that allows disagreement and pretty divergent opinions [to] still be respected and welcome."